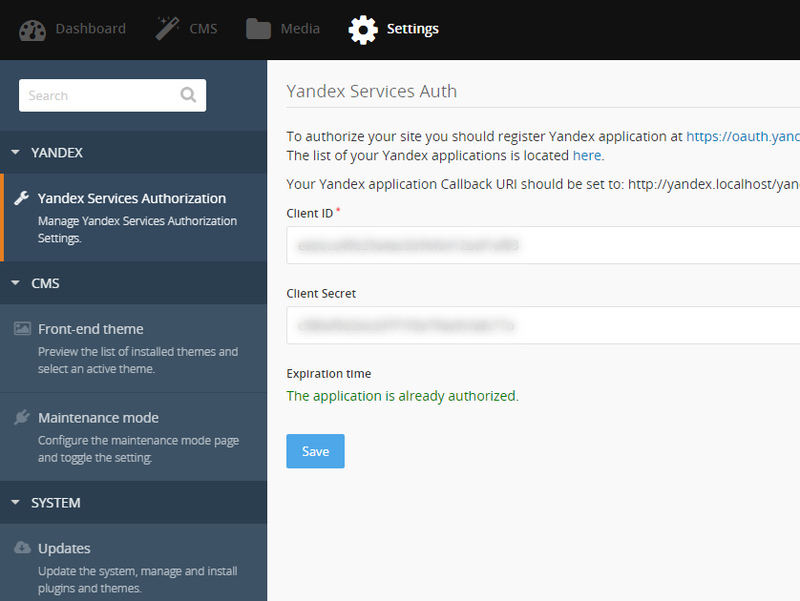 This project is the common authorization API for all Yandex services which support Yandex OAuth method. 'token' - default parameter, the function returns auth token. It's used in almost any requests to Yandex services. To authorize your site you should register Yandex application at https://oauth.yandex.ru/client/new. Save your application Client ID and Client Secret for later usage. Then go to Backend System then find Yandex in left side bar, then click on Yandex Services Authorization and paste application Client ID and Client Secret into the corresponding fields. Then press Save button to submit form. You will be redirected to the special Yandex page. You should confirm your application authorization on that page. Enter your Yandex login and password if it will be necessary. Then your will be redirected back to the settings page on your site.